Magnesium - One of Your Most Important Minerals! Add the basil, fresh Ontario hemp seed and garlic in a food processor and pulse until roughly chopped. At medium speed, gradually add the hemp oil until smooth. 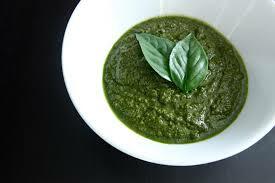 If the pesto seems too thick, add more hemp oil until smooth and creamy. Season with salt & pepper to taste. Add the cheese and pulse a few more times. Add to your favorite past for an omega-rich meal! Variation: If you enjoy the unique taste of cilantro, substitute the 2 cups of basil for one cup of fresh cilantro and one cup of flat leaf parsley.